From all the chairs where I sat and will continue to sit on, (or stand on, or roll out of the way), to conceptualize, organize, and generate this project... I will nominate these collection of thoughts a prospective, the originating hopes and goals of an emerging cultural project. 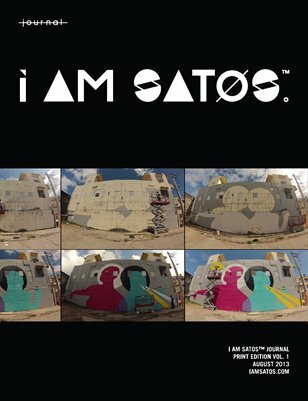 i am satos™ is being built on a desire to generate a place that comes alive with the encounters between young creative Puerto Ricans who are engaged in variable personal, academic and professional projects. These individuals work within the majority if not all the Journal's themes, yet their experiences with these themes in their actual settings vary interestingly within a common cultural base. As a collaborative we promote that these individuals come out from anonymity by sharing their work and thoughts, and thus we expose them to other cultural collectives as well as celebrate them within their own. The Journal is set to discover these experiences as cultural observations as it proposes a channel to rethink how culture reaches the masses. Ideally, this project will be evolving each time a collaborator shares an experience through the submitted pieces of work. This collaborators at first share their knowledge intuitively, not knowing they that with every piece they become at the same time educators. These pieces vary in format: essays, reviews or commentaries, or even just a few words suffice to share with the world a sample of their lives. There is not a set geography or situation where this takes place. Each collaborator travels through their contexts in different manners with particular tools and skills. Yet in this platform we will see them come together or further disperse. Our readers are thrown in the mix to witness the satos' evolutions, and ultimately are invited to affect their paths. The platform offers a chance to open channels of conversation in an effort to bring together creative spirits and convert a few others into the sato's lifestyle. I welcome you, local and tourists of the world, to become part of this community of satos. I hope this is a place for journeys, where thinkers become doers, and doers become leaders. Most of all, I hope you have fun in your journey. Note: Some graphic elements on the Home page are taken from thenounproject.com. Our gratitude to their service and designers. Give them a visit!